I scream! You scream! We all scream for ICE CREAM! Yumm! I think just about every little one thinks ice cream is delicious! 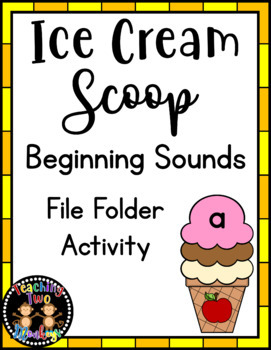 And they will surely enjoy this ice cream themed beginning sounds math file folder activity! This theme is also fun for the month of May or Summer Preschool. Students can practice recognizing lowercase letters and letter sounds. File folder activities are fun, easy to take out and store away, promote educational activities, and also help improve fine motor skills, hand-eye coordination, critical thinking, and more! You can use this activity in your literacy center, literacy tub, file folder collection, preschool classroom, kindergarten classroom, SPED, homeschool, summer school etc. 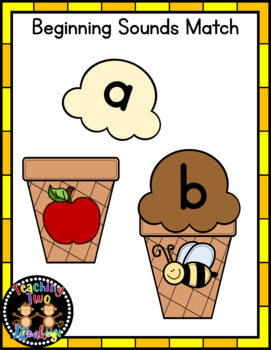 2 Activity Mats with easy to identify pictures written on the ice cream cones. 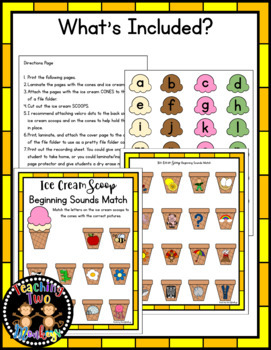 1 page with all lowercase letters (a-z) written on the ice cream scoops. Print and laminate. Attach the 2 mats to the inside of a file folder. Cut out the ice cream scoops. Students say the name of the pictures. 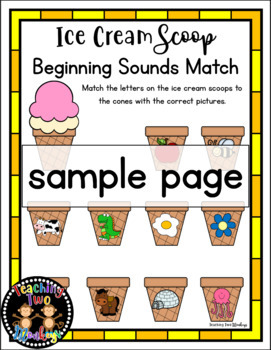 Then say the beginning sound and find the ice cream scoop with the letter that correctly matches the beginning sound.